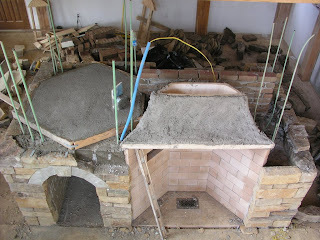 We used firebrick to build the hearth of the wood fired pizza oven. First, we spread Heat Stop refractory cement (fireclay) to the base using a 1/4" notch trowel and then we placed the firebricks bricks on the cement as tight as we could. Three times, we pulled a brick back up and removed or added cement to the bottom of it in order to get them all to lay flat. A brick that's too high or too low could keep the peel from sliding easily into the oven. A book called "The Bread Builders," recommends omitting the mortar between the bricks (I followed their advice) because it could wear off into your food, and because it will make your life simpler if you ever endeavored to replace a brick in the hearth. It wasn't necessary to cut/break the bricks precisely at the edge of the hearth, because these edge bricks get covered by the sides of the pizza oven. In the back of the hearth, we left a blank spot for the ash dump (this hole could serve as fresh-air makeup if needed). Immediately after finishing the firebrick hearth, we started cementing the brick oven segments into place on the hearth. The kit contains 5 oven segments and the entrance tunnel, so each piece makes up 60 degrees of the 360 degree circle that forms the pizza oven. Jockeying the cast ceramic pieces around to obtain the best fit (while maintaining the thinnest mortar joints possible) was not trivial, so I was glad to have the stone mason there to help. These are large heavy pieces that have been molded wet and then presumably fired in a kiln, so the tolerances are a little loose. When we finally got most of the joints to be 1/4" or smaller, I decided that the bread and pizzas weren't going to care how big the joints were. We let the assembly setup over night and the next day I came back and placed the dome on top. I left the joints on the outside of the segments sloppy, but because the cook (my wife hopefully!) will be able to see the joints on the inside of the oven, I used a wet sponge to clean them up (just as you would when grouting floor tile). For the joints in the back of the oven, it was necessary to nail a sponge to a long stick! After the whole thing was assembled, I started troweling on "insulating castable refractory" purchased with the pizza oven kit. Two 35 pound bags provided a little les than 1" of coverage to the surface of the oven. I found it hard to get more than an inch of wet refractory to stay on the sides of the pizza oven, so I waited a day before applying the second coat (another two bags). The first coat was rough and had cracked a little, so the second coat stuck much easier. This last picture shows the pizza oven covered with the insulating refractory next to the Rumford. I just finished cutting the stones for the arch above the Rumford. I cut the keystone for this arch and the stones in the smaller arch from the same very large piece of rock. Recently, we poured the concrete slab that the pizza oven will sit upon. Beneath the pizza oven are two wood storage alcoves, so it was necessary to build wooden forms. The slab that supports the pizza oven also serves as the ceilings for the wood storage alcoves. For reinforcement, I threw in some left over woven wire (mesh) fence before we bucketed in the concrete. After placing 8" of concrete, I worked in some horizontal rebar to further strengthen the slab. A sacrificial scrap of yellow foam insulation was used to "blockout" the space for the ash dump in the back of the pizza oven. Just as the concrete was starting to set up, I laid out the floor plan of the pizza oven on the slab (top left picture in collage). The next day, I built a form to match the floor plan. Into this form, I poured a homemade concoction of perlite and cement that will help to insulate below the pizza oven (top right picture). This insulating layer is 3.5" deep. Most recipes on the internet say to use a 6:1 ratio of perlite to cement, but I found that the volume of the perlite decreases by a factor of two when you get it wet in the mixture... hmmm confusing. The ratio that I settled on was 4 cu feet of perlite (dry) to 50 pounds of cement (dry). This makes about 2 cubic feet of castable insulation and costs less than $15 (perlite: $8 , cement: $5 , water carried in buckets from the pond: priceless). The manufacturers of the pizza oven kit sell "castable insulating refractory," which I presume is a mixture of perlite and exotic fireclay and will probably tolerate higher temperatures than my homemade brew. It must be something fancy, because it costs about $50 for 35 pounds, and only makes about 1 cubic foot. To be safe, I put 1.5" of the fancy "castable insulating refractory" on top of my homemade refractory. (It took $100 of that stuff to make a 1.5" layer - egads!) Instead of building another set of forms for this second layer, I simply loosened the screws on the first set of forms and raised them up 1.5". (the first layer was of course partially cured). 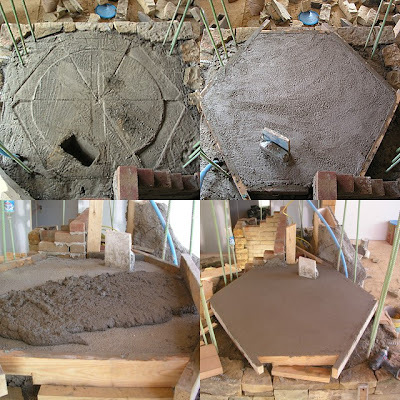 The finished slab, ready for the firebrick hearth, is shown in the lower right picture of the collage. So now I have a 6" layer of fireproof insulation upon which we can build the wood fired pizza oven. I am told that you can't put in too much insulation... it will reduce the time it takes the oven to come up to temperature, it will increase the time that the oven stays warm, it will burn less wood, and it might make using the oven on a cool summer night tolerable. These are all good things , so I'm trying to fit as much insulation as I reasonably can. By the way, when I poured the homemade insulation layer, I got a little carried away and mixed too much insulation, so I parged the throat of the rumford with the leftovers. Here's a picture of the Rumford next to the pizza oven base. We're working on the inside of the house most days, and the outside of the house is likely to look like this for several months, so I thought I'd post a picture. You can imagine what our finished house will look like if you... replace the road cone with a copper finial, take the plywood off the top of the small stone tower, add stone (yet to be quarried) all the way up to the top of the tall tower, remove the cement mixer from the front yard (done! ), cover the tyvek with stucco, insert a timber frame entry between the two towers, carry the stone around the right side of the house, build gutters-fascia-soffit, and add a porch (on stone piers) to the gabled face of the house. Hmmm. Not much left to do on the outside... we'd better keep working on the inside. Here's a view of the wood cook stove alcove as viewed from the kitchen. Instead of using cinder blocks (parged with stucco) to build the alcove, I decided to use bricks with colors and textures that match our native sandstone. Visible in this picture is the 8.5"x8.5" flue liner for the flue that will be used to vent a possible furnace or hot water heater in our basement. The flue liner barely fit between the back of the Rumford and the back of the cook stove alcove. Behind the flue liner, you might be able to see that I parged the back of the Rumford firebricks with a mixture of (mostly) Perlite and (a little) mortar. I think normal protocol is to leave an airspace between the firebrick and the rest of your fireplace structure, but I figured this mixture could serve the same purposes. (bond break, insulation, and to some degree room-for-heat-expansion.) What the heck - can't hurt can it? After laying the bricks and stones up to an elevation of 3 feet 6 inches, it was time to fill the entire assembly with concrete and rebar. Mud season is upon us, so instead of ordering a small batch of concrete from the plant, I hauled 44 bags of quickcrete and two bags of straight Portland cement to the house site with my pickup truck. I was going to try it in one trip, but when they put the pallet on my truck and it popped a wheely, I decided to haul it in two trips! Here's the green Ford in my backyard with 28 bags of quickcrete, 6 bags of Type-S, and 2 bags of Portland. Trust me, it didn't want any more! We mixed the concrete one wheel barrow at a time in the mason's Honda-powered mixer. To every 4 bags of quickrete, we added 2 shovels of Portland cement... just because quickrete never seems as substantial as concrete from the batch plant. Over the course of a few hours, we packed all of the concrete into the house with used drywall buckets... half full thank you please! 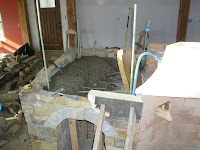 The picture to the right shows the concrete after it set up in our "stone and brick" form work. I was a little concerned that the brick or stone could blow-out from the pressure of the concrete, but it never happened. We were careful to mix the concrete fairly stiff, and the reality is that by the time we poured the last bucket into the assembly, I'm pretty sure the first bucket was fairly solid under all of it. I laid rebar into the wet concrete as we went, and occasionally, I'd chuck some stone chips or broken cinder blocks into the mix. The missing brick in the side of the Rumford is where the ash pan for our bread oven will sit. (hidden by a loose brick of course.) This opening will also allow fresh-air to enter the bread oven, giving us more control over the fire in the bread oven. That's the theory anyway. I can't wait to get the whole structure up to 4 feet, because I can then start building the much anticipated bread oven (also a kit from rumford.com... hmmm... I sure am placing a lot of faith in these folks.) This final photograph is the wall into which the bread oven will be built. Today I'm adding links to two new timber frame blogs. Although they're just getting started with their blogs, both of these guys have taken timber frame workshops, and have some combination of tools, timbers, and land. I'd say they're serious about timberframing. Good luck guys! After searching antique stores, browsing ebay, and pouring over specifications from manufacturers, we decided to buy a new "Waterford Stanley" brand cookstove from Lehman's. We hadn't intended on purchasing the stove until after we moved in, but I recently realized that fitting a cookstove back-to-back with our Rumford fireplace and beside a pizza oven, while still allowing enough room in the kitchen for an island was going to be no mean feat. We are literally building the masonry alcove around the stove. They must use wood cook stoves for real in Waterford, Ireland (where the stove is made), because it is the most practical design I have seen, in terms of fitting it into a kitchen without taking up half of the kitchen. For instance, you can plumb the flue out the back of the stove or out the top, and the flue does not take up any more space than the stove itself. The stove also has 2" of insulation around the sides and back to allow closer fitting to the walls, and to keep the heat in the stove itself. Finally, the Waterford is made of solid cast iron, not a steel frame with cast iron bolted to it. At over 700 pounds, this sucker is heavy! My wife and I took an entire day to drive up to Lehman's showroom and buy the stove (that's it wrapped up in the back of our truck - they sold us a showroom model). It is no exageration to say that they have a dozen wood cook stoves and over three dozen regular wood stoves on display in two different showrooms. Located in Amish country, Lehman's is without a doubt the world's most awesome store. 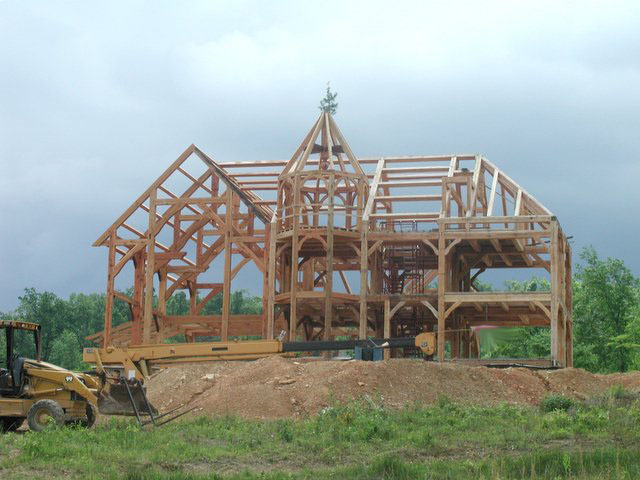 Imagine 8 or 10 buildings (one of which is a timber frame barn!) connected together as one single store nearly a quarter of a mile long. To quote my wife "you can buy gourmet salt and gaskets in the same store!" I'd say over 50% of their inventory is "made in the USA." (Possibly over 80%). And most of their merchandise does not require electricity. If you're within 5 hours of Kidron, OH, I'd suggest driving there... today! If not, you can shop them on line. For us, I think it should become an annual ritual to visit their store. The weather outside has turned nasty, with alternating rain, snow, and sleet, so the stone mason and I have moved indoors to work on the fireplace. I had started on the fireplace months ago (link to that blog entry), but other projects called me away. Pausing the fireplace progress was serendipitous, because now I have a real stone mason to help me. He shows up on alternate days to advise and to help me glue together the dry laid stone puzzle that I have been piecing together. Recently, I tackled two arches. The first arch (over the kitchen wood storage alcove) is pictured here. After cutting the stones, I decided to test fit them. I placed them on an arched wooden form and wondered if they would stay even without mortar. Curiosity got the best of me, so rather than wait for the stone mason I slowly removed the wooden form. The stones didn't budge! To bask in my miniature victory, I stacked 6 pop cans (full and unopened) on the keystone. I couldn't wait to show the kids and my wife. My 9 year old son's response "Uhh, big deal Dad, I do that with Lincoln Logs all the time." My 7 year old son's response "I'd like to knock that down." 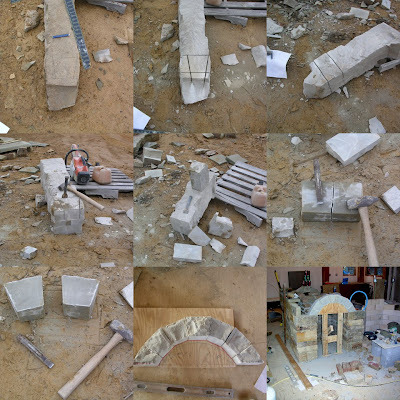 In any case, I took pictures as I made the second stone arch (over the great room wood storage alcove) so I could explain the process. If you ever decide to try this yourself please keep in mind that there are many possible paths to complete any task, I just happen to be particularly adept at finding the slowest path! First I used a piece of flexible Pex pipe to define the shape of the arch. Yes, you can draw a curve (spline) on the computer, but it's nice to see your curve at full scale and bending a piece of pipe is more intuitive than dragging a mouse. After I traced the curve on to a piece of plywood (later to become my wooden form), I entered the dimensions of the curve into the computer and drew the stones that I would need. I printed out a drawing of the stones complete with dimensions and headed to the back yard with the tools you see here. Each of these tools has an analog in the craft of timber framing... only the raw material has changed. I was surprised that the large rock beneath the framing square provided me with enough stones for the first and second arches. In this picture, the stone is half of its original size because the first arch has already been cut. It was still difficult to maneuver... this is not something you try on saw horses! The first picture in the collage shows the profile of one small stone, laid out with pencil on the large doner rock. The second picture was taken after I scored the rock along the lay-out lines with a chop saw. The rock was about 9" thick, and the chop saw cut only about 4" into it. In the third picture, I carried the score marks all the way around the big rock. Even though I cut all four sides of the rock, I was not able to cut all of the way through it. I used a chisel and hammer to liberate the smaller piece of rock containing my stone from the larger piece of rock (4th picture). With a more manageable chunk of rock, I was able to carry the chop saw cuts all the way through the small rock to get the stone profile I needed (center picture). Patiently, I tapped the 9" thick stone all the way around its perimeter with the chisel until it split into two stones that were each 4.5" thick (6th picture). In the 7th picture, you see the result - two stones, each a mirror image of the other. I could have used a chop saw to more predictably cut the stone into two usable stones, but the resulting texture would not have been as pleasing as a "split face." After cutting the keystone, the two stones to its left and the two stones to its right, I laid them all out on my plywood form guide only to discover that my method of cutting the stones had introduced enough error that I needed to modify the design of the remaining two stones. Fortunately I had not cut them yet. As I had anticipated, the rocks that the arch would rest upon also dictated some minor modifications to the two stones at the base of the arch. (notice the scribe marks on the base stones in the 8th picture). Finally, I traced the profile of the assembled stones on to the plywood. The shape of my actual arch deviated a bit from my theoretical arch, and I wanted my form to support the real arch, not the theoretical arch, so I cut the plywood to match the real arch! In the final picture, you can see the arch assembled! This great room arch has 7 stones whereas my kitchen arch had 5, so I was not so bold as to remove the form before adding mortar and surrounding stones! If you've read this far, you might be interested in one bit of minutia that may or may not matter. I've decided that it does matter, so I took great pains to pay attention to this detail... Every stone laid in our house so far (outside and inside) is laid just as it came out of the ground, with the "bedding plane" or "grain" of the stone parallel to the earth's surface. (Well OK, 50% of the stones are probably upside down, but that doesn't matter!) Based on reading and experimentation, I decided this was important because sedimentary stone like ours splits most easily along its bedding plane. It was deposited millions of years ago one microscopic layer at a time, so if it ever does crack, it likes to crack along these layers. Cracks can weaken the stone, and admit water, which can freeze, further weakening the stone, perhaps causing flakes to spall off. If the cracks are horizontal, they don't matter too much, so we lay the stones horizontal. Now for the twist... Which way should the grain run for the stones in the arch? Each stone in the arch is pressing radially, toward the base of the arch. For instance, the primary direction of force transfer in the keystone is to the left and right, not downward. If the keystone were to crack and the crack ran horizontally, I would think the bottom of the keystone could fall downward (granted, this is an extreme example). By thinking about which cracks would least affect the structural integrity of the arch, I decided that the grain in the arch stones should be arranged liked spokes on a bicycle wheel, and that's what I did! It meant passing up lots of doner rocks before I found one from which I could cut the suitably sized arch stones pictured here. I might very well abandon this sort of rigor when I have to cut the nine stone arches for our tower!